Depending on its scale, your office refurbishment could be among one of the highest expenditure items this year so it?s important to budget for it accurately and monitor the projects costs closely, looking for where you can save money as well as spend it! Beware of any hidden costs and make sure your office refurbishment company provides a detailed quote. Partnering with a professional and experienced office refurbishment company will reduce the likelihood of any nasty surprises. Your budget should have a contingency for unforeseen challenges or elements that you wish to adjust during the project. Even with the best pre-project planning, there are often ideas that emerge during a project that warrant being incorporated into the plan. Within your budget be sure to also include professional fees, IT infrastructure costs, furniture, telecoms and insurances. Tip ? Don?t forget the costs for marketing and PR to announce your new look office to your stakeholders and customers. Timing is crucial when refurbishing offices, if your company is affected by seasonal business, it?s wise to schedule the refurbishment during the quieter period. It?s not a good idea to schedule it when the business is in its planning phase and senior management require peace and quiet to focus on preparing the business plan or when the marketing team have a significant event coming up such as a product launch or new advertising campaign. Office refurbishment companies are used to working around you to ensure business as usual and will normally be able to split the project into phases. You can discuss with them the work that can be done during business hours and what needs to be done outside of business hours to minimise disruption in your offices. Tip ? ask your refurbishment company for examples of where similar projects were carried out and how they minimised disruption. The aim of a building appraisal is to look at the available internal office space and environment and carefully consider whether it meets your business requirements for now and in the future. Once the surveys are completed, it should not only present an accurate guide to the state of the building, but also confirm its physical size and potential limitations and opportunities. A full survey should ensure that every aspect is taken into consideration before commencing space planning. Your office refurbishment partner should be able to undertake the majority of the survey work required and should recommend other professional advisors such as structural engineers and asbestos specialists if required. 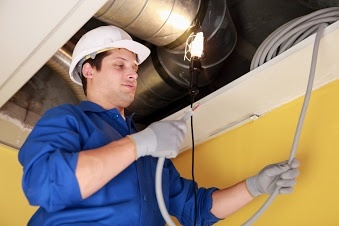 If you?re engaging in a major office refurbishment where you are stripping out everything, it?s an ideal opportunity to examine your lighting, air conditioning and ventilation systems to see how they can be improved. Systems you may want to consider are a lighting control system which is motion detected, and an Energy Management System (EMS) to make your office more energy efficient. We hope you found this guide useful. Watch out for next week?s instalment with part three of our guide to office refurbishment.